Collection of VEDIT macros and other resources for Python programming. This package contains some Vedit macros and other useful resources for a Python programmer. You can run the macros from a Python specific Tools menu (pyTools.mnu). A Template Editing macro (Python.vtm) implements smart indent while you type. In addition, the package contains keyboard definition (python.key) for Python. For easy download, all the macros and other files are packed in the file pyTools_10.zip. Click the link below to download the package. Unzip the files from pyTools_10.zip into your user-mac directory. Run preset.vdm and select Python. Save a project for your Python programming. This saves Tools menu and other configuration options. 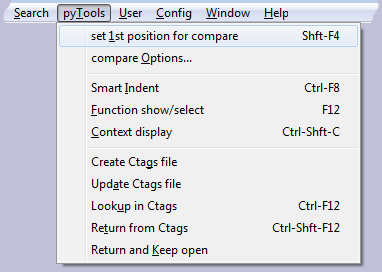 pyTools.mnu is a Tools menu for Python programming. It replaces the standard Tools menu (or Compile menu). From this menu, you can easily call the macros below and perform other functions useful for Python programming. Tip: use the macro preset.vdm to load this menu and to name it "pyTools". *) These macros can be found at other parts of my site. Click the link to see description. 1) Standard Vedit function. For details, see Using Ctags. Python.vtm is a template macro for Python. It implements smart indent while you type. After you press Enter key, the template macro calls pyIndent.vdm to indent the next line depending on the contents of the previous line. If you press the : key, the indent macro checks if the current line needs to be undented (e.g. for else or elif statement). To enable automatic indenting, load the template macro python.vtm, then save file type specific configuration. pyIndent.vdm implements simple Smart Indent functionality. You can indent a single line or a highlighted block. If a block is highlighted, re-indents the whole block. The indent level of the first line is adjusted based on the previous line. The amount of indent depends on the configuration setting "indent increment". Since in Python blocks are specified using indenting itself, it is not possible to automatically detect the blocks for indenting. Therefore only simple indenting rules are used. When a line contains if,elif,else,for,while,def or class, and the line ends with a colon (:), the next line will be indented. If a line that contains else or elif (and ends with a colon), the indent level on that line is decreased. Optionally, comments at the beginning of line are not indented (select by setting #91 in the macro code). Otherwise, the indent level will be same as on the previous line. Indenting is not changed on a line if the previous line is an empty line. This is because the macro can not know where your code block ends. This can be easiest done with preset.vdm macro (see installing above). pyFunc.vdm is similar to cfunc.vdm. It lists functions and classes in an indented list. You can use the same keys as on cfunc.vdm to select a function and go to the definition, etc. (F1 opens the help file of cfunc.vdm). In addition, you can use Ctrl-Up and Ctrl-Down keys to move to previous/next line with the same indenting level (previous/next block). Show docstrings that describe each function (if one has been written for that function). In addition, you can adjust function list window width and colors. pyContext.vdm displays the context of current cursor location. A window opens to list class, function, loops, if blocks etc. inside which the cursor location is. Press Esc to close the window. Or, use cursor Up and Down keys to select a line in the display, then press Enter to go to that location in the file. Update Ctags file runs ctags.vdm with previously entered settings without showing the dialog box. This is a quick way to update tags database after you have made changes in your files. Lookup in Ctags finds a function from tags database and instantly switches to function definition. It calls the macro utags.vdm. Just put cursor on a function call and press the hotkey (Ctrl-F12). Return from Ctags switches back to the file and location from where "Lookup in Ctags" was called. These calls/returns can be nested to unlimited depth. If the file was not open before calling "Lookup in Ctags", and the file has not been modified, "Return from Ctags" closes the file. Return and Keep open menu item is the same as Return from Ctags, except that the file is not closed even if it was not previously open and it was not modified. For more details, click [ Help ] button in the Ctags.vdm dialog box.